October | 2013 | Old Bat On A Bike. Burton Bradstock back to Hurn – 178km or 110 miles with 2100 meters of ascent. I had planned to ride the two parts on consecutive days but it was raining (!) so I delayed a day. This also gave us a chance to recover. Leaving Burton Bradstock I met up with Steve in Bucky Doo Square in Bridport and we set off into the Marshwood Vale to Whitchurch Canonicorum. The South Western limit was Charmouth (half of Lyme Regis is in Devon) and we rode up to Monkton Wyld to follow the border along the B3162 and down to Drimpton and on to Mosterton and Cheddington. 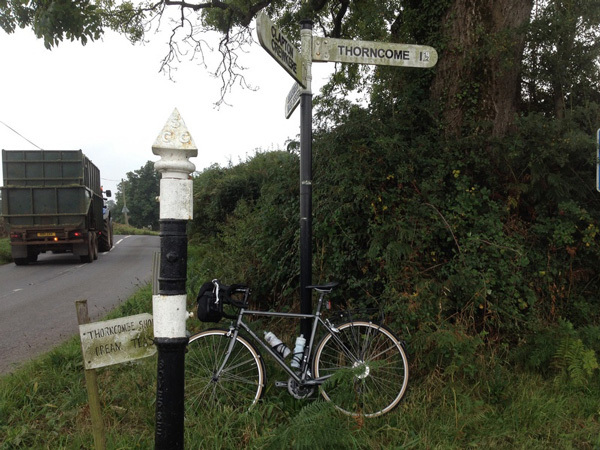 This entry was posted in Cycling, Dorset on October 2, 2013 by Ian.